'Lunar Frost' (Keith Keppel, R. 1995). Seedling 91-50A. IB, height 23" (58 cm), Midseason bloom. Standards and style arms white; falls white, 1/2" spot of cadmium lemon (M&P 9-L-1) to aureolin (10-L-2); beards white, yellow in throat; ruffled; pronounced sweet fragrance. 'Over Easy' X 'Overjoyed'. Keppel 1996. Honorable Mention 1998. 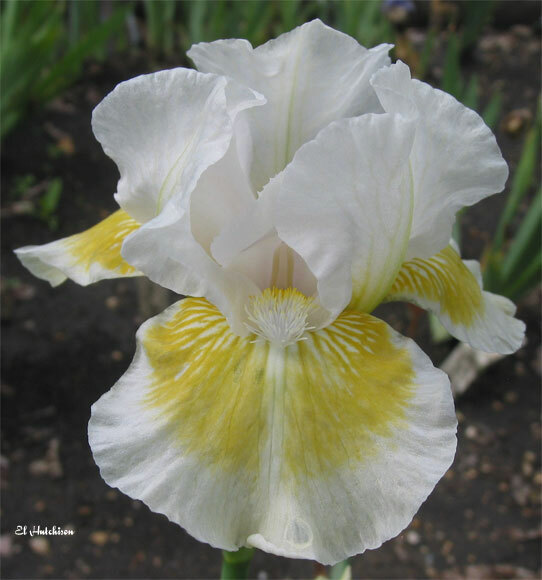 From AIS Bulletin #300 January 1996 Introducing LUNAR FROST (Keppel) IB-M 23" (Over Easy X Overjoyed) White with 1-1/2" soft yellow moon below beard. #91-50A. 15.00. Keith Keppel.